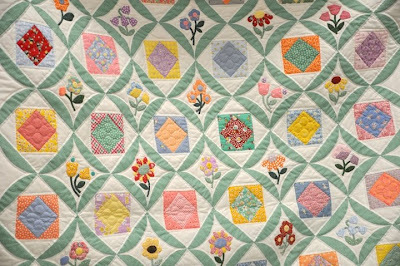 From time to time I will be posting pictures from the new group that Amy started at her quilt shop called Amy's Cupboard Club. Here are a few pictures from our first meeting. I'm hoping I got everyone's names right as I tried to take notes as I took pictures. Now for Show N' Tell. . . 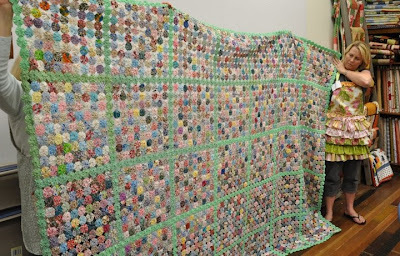 This is Ashley showing us her Husband's Great Aunt's YoYo Quilt. 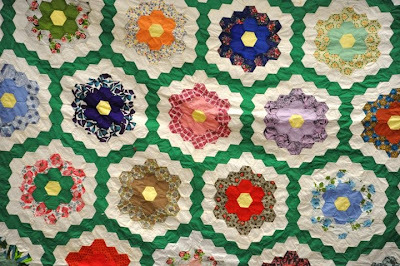 It's a Kingsize quilt. I can't even begin to think about making all of those yoyo's. It's pretty amazing closeup. 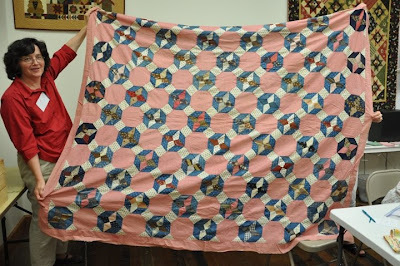 I wonder how many yoyo's it took to make this quilt. 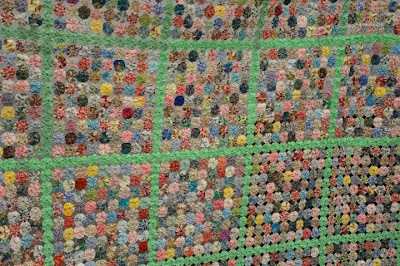 I counted 81 yoyo's per square (inside the green borders). Okay, I started to count them and there are 7 blocks across by 5 rows down. So that's 35 yoyo sections of 81 x 35 = 2,835 yoyo's not including the green yoyo's. Maybe I'll have to count those later. This is Verlene's Thrift Store Find. Can you believe how pretty this Grandmother's Flower Garden is? 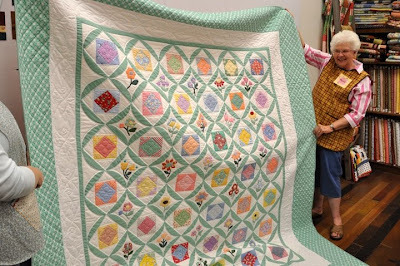 This is Debbie's husband's Grandma Daisy's quilt. 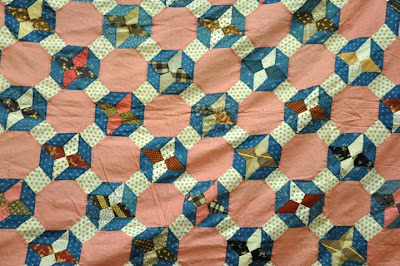 I love how it's hand pieced and if you look close you'll see how even some of the pieces are pieced. She really used every scrap of fabric that she had available to her. 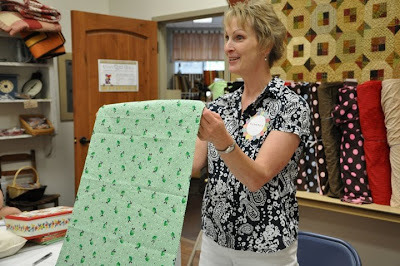 This is Elizabeth, Amy's Mother (Amy's Mom) showing us the quilt that she just finished not too long ago. 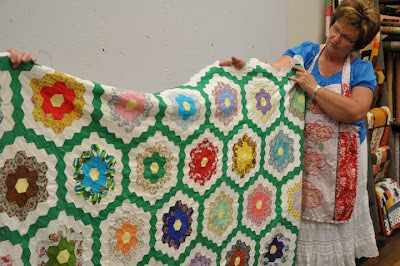 I love the applique and how she set the blocks in the quilt. 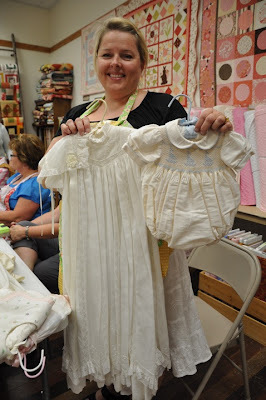 Rae Ann loves vintage fabric and has been collecting it online and at various garage sales and thrift stores. Here are just a few pictures of what she brought with her that night. 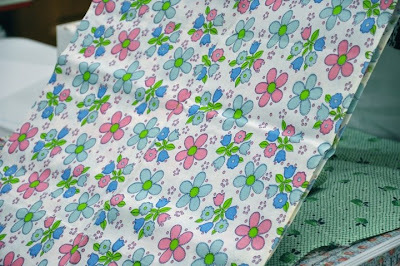 I love this sweet and happy flower fabric. 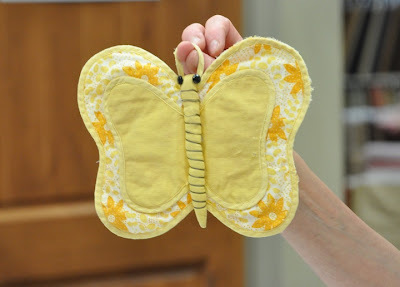 Rae Ann brought this adorable vintage butterfly hot pad. 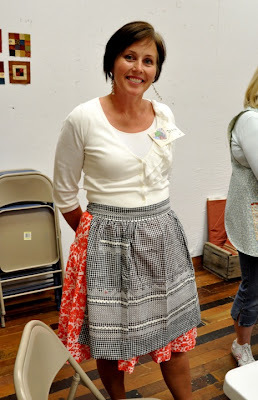 Diane is modeling a vintage gingham apron her grandmother made. 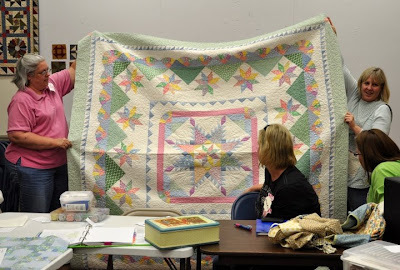 Becky made this gorgeous Feathered Star Quilt. 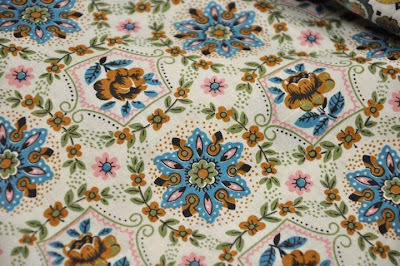 I don't know the name of the pattern but I really love it. 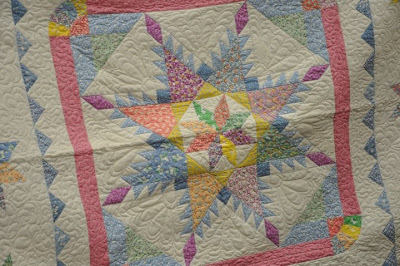 Here's a closer look at the star in the center. 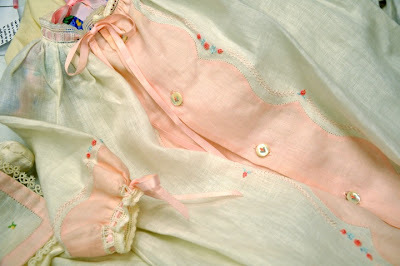 Diane is a very talented seamstress and shared with us these dresses that she's made for her children. Look at the beautiful detail on this outfit. 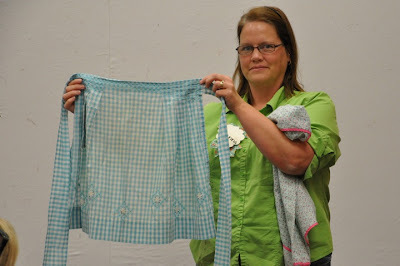 I just loved your show and tell....awesome quilts, aprons...love the butterfly hotpat. Interesting group of ladies. And so talented too! Lovely things you had to share with us. Wow! What beautiful things! 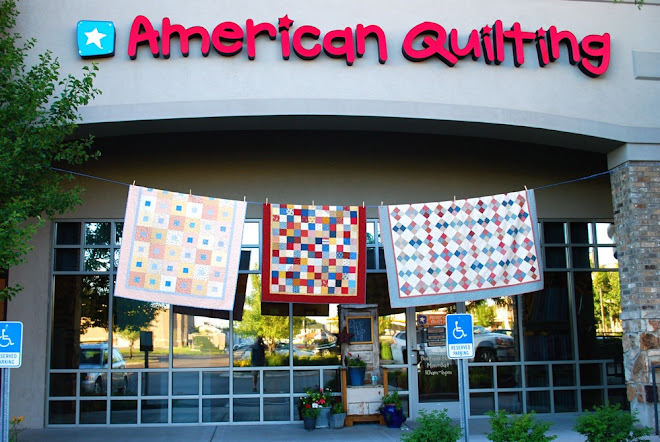 And the yo yo quilt--egad!! I can't even imagine! !